The table above gives us a great picture as to where the earnings power of the labor force is and where it’s not (note how small mining and logging are). 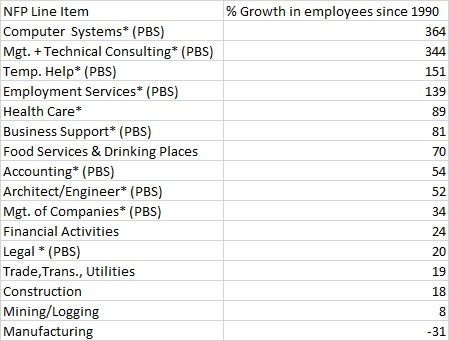 Professional and business services (PBS) and Education and health services (EHS) account for 40% of labor force earnings. Leisure and hospitality which includes food service and drinking places only accounts for 6% of labor force earnings. Every NFP report, financial media likes to place the emphasis in a derogatory way on food services when they should be more focused on the significance of PBS and EHS. Next, I’d like to look at the growth rates of different industries within the NFP report. The table below decomposes the PBS line item and compares it against other major categories. **All data in both tables are from http://www.bls.gov and FRED. The table is sorted by the YTD growth % column. We can see that the top earning positions also have some of the best growth. 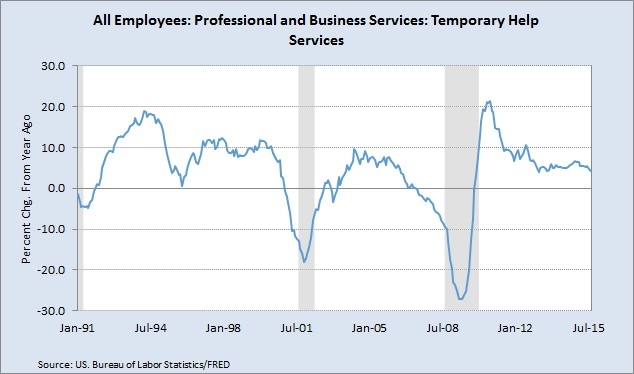 Looking at the temporary help category, its interesting to note that its growth peaked right after the crisis and has now come down to normal levels as the workforce has normalized. A point quite often neglected in financial media which also lends itself well to the economy being towards full employment. More importantly, the labor data meshes perfectly with recent ISM and Markit Services data releases. ISM and Markit had diffusion index readings well north of the expansion line (50) at 59 and 56.1 respectively. The headline of the Markit report read “Sharpest increase in service sector output for three months in August.” Barron’s called the ISM print “in the stratosphere.” What we are seeing is corroborating evidence from multiple sources that the service sectors are growing the economy. Just for laughs..Here is data for as far back as FRED went for most categories.. The point that I am making here is that the economy is growing in all the right places and business is strong where it counts. For the 2010-2014 period, the World Bank had services counting for nearly 80% of US GDP!!! As services continue at their strong pace, I would expect to see Q3 GDP around 4% conservatively. ISM has GDP tracking at 5%. Average hourly earnings for August came in at a solid 2.2% YoY gain. This is especially solid when factoring in the demographic trend of older higher paid workers being replaced by younger lower paid workers. (Thanks to Ed Bradford on Twitter @fullcarry for first bringing that change to my attention months ago). Hours worked also ticked up .1 to 34.6. Hours worked improving is significant given the number of employers that have scaled back employee hours in order to avoid Obamacare mandates. Clearly there has to be demand to be driving job and hours growth. Overall, we have a labor market that has been resilient to some significant headwinds and has continued to grow. As we get closer to Fed tightening, markets have become even more volatile. Namely China and the rest of EM. We have a few different things going on here. One of which is the idea that China is on the brink of disaster and has weakened its currency in hopes of spurring the economy. The fact is, China is moving away from an export based economy to a sustainable and more independent consumption based economy like the US. This transition will be tough, but is necessary for the long-term health of the Chinese economy. Back in March this year, we have Zhang Gaoli, a member of the Politburo (China’s ruling political cabinet), saying “The growth model featuring high input, high energy consumption and over dependence on external demand is no longer sustainable.”Translation: China will no longer be the workhorse for the global economy. Keep in mind, this policy change was introduced just after the financial crisis as a response to the impact that the crisis had on China’s heavily dependent export economy. What’s interesting, is that if all the EM economies followed suit and took steps to straighten their own houses out, they wouldn’t be EM anymore. Yet, time and time again, EM governments make poor financial choices that will impede their economies for years to come. Given that mismanagement, we still have the IMF, World Bank and a cacophony of financial media pundits saying the Fed needs to hold off on rate hikes until EM is ok. When is EM ever going to be ok? What problem should the Fed pick from the pile to use as its metric that EM is ok? If the Fed is to consider potential effects upon EM, then there may never be a time to raise rates. Sticking to ZIRP in hopes that EM will be ok would be like staying in a destructive relationship because your friends like to use your partners beach house. The FED has mandates for a reason. No one even knows what may or may not happen upon liftoff. However, what we do know is that in the US we are literally blowing another real estate bubble that the Fed does not want to be responsible for. We do know that pensions and savers have been penalized long enough. We do know that our economy has no business being on emergency monetary polices when there is no longer an emergency. I believe the Fed will use this time we have right now to begin to normalize rates so that if a sudden shock does come soon, they have some ammunition left to fight it. One thing is for sure, the next week is going be a bumpy ride and hopefully in the end, the Fed will stick to its mandates and do what is right is for the US economy.